WBA super featherweight champion Gervonta Davis (20-0-2, 19KO) of Baltimore Maryland almost threw his future out of the window at the Dignity Health Sports Park In Carson, CA Friday when he missed the 130 lbs. weight limit contracted in his title defense against Mexican challenger Hugo Ruiz (39-4-0, 33KO) of Sinaloa. Davis first stepped on the scale at 130.6 lbs. Then they stripped him to his birthday suit in an effort to make weight but he still was at 130.2 lbs. on the second try. Per CSAC rules Davis was given an hour to lose the excess and many in the room at the weigh-in have no doubt he will lose it and the fight will go on as scheduled. It was amazing to see Hugo Ruiz’s reaction the first time Davis stepped on the ring. One can almost hear him say to himself – “Oh no not again”. Ruiz was supposed to tangle with Filipino IBF super featherweight champion Jack Tepora three weeks ago at the Pacquiao-Broner fight in Las Vegas. But Tepora came in 6 lbs. overweight. 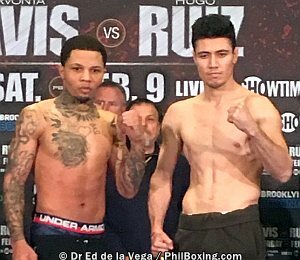 Ruiz was given a substitute opponent whom he disposed easily earning him the fight versus Davis. But Ruiz was not the original challenger of Davis. Davis was supposed to defend against Abner Mares. Mares suffered a detached retina during training forcing him to withdraw. Incidentally, Ruiz had no problem making the limit. He came in at 129.5 the first try. 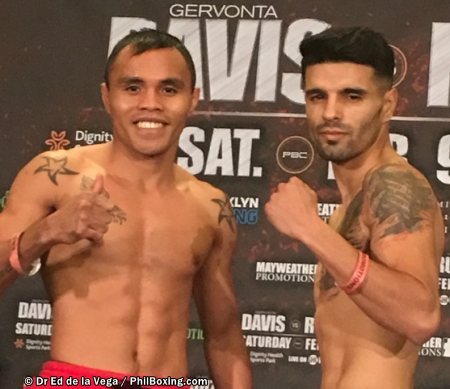 For the first televised fight on ShowTime, Javier Fortuna (33-2-1, 23 KO) of the Dominican Republic weighed-in at 135clbs and his opponent Sharif Bogere of Las Vegas was 135.6 (32-1-0, 20KO). Genisis Libranza (L) and Gilberto Mendoza. On an undercard fight that is of interest to the Filipinos, Genisis Libranza (17-1-0, 10KO) of the MP Promotions via Nonoy Neri‘s Davao Stable, had no problem hitting 113 lbs. His opponent from Modesto, CA, Gilberto Mendoza (11-6-2,4KO) was 112.8. Erickson Lubin (19-1-0, 14KO)- 155.8 vs. Ishe Smith (29-10-0, 12 KO) 155.8 lbs. Xavier Martinez 12-0-0-8KO) 131.4 vs. Deivi Bassa ( 20-7-0, 12KO) 141.8 lbs.